The events of 11 September 2001, was the catalyst that impelled This American to journey to both sides of Israel’s Wall in 2005. I was in Jerusalem researching for my first historical fiction, (inspired by the life of an American Palestinian Muslim from the Galilee who made his way to the USA and into a TOP SECRET position in the Defense Department during the Cold War) when a serendipitous meeting with Israel’s nuclear whistleblower, Mordechai Vanunu, inspired me to realize my childhood dream of becoming a reporter. I am also the granddaughter of a German Jew who died before I could learn how many of my relatives were gassed or fried by the Third Reich. That day we call 911 irrevocably altered my life and because the media were not asking my questions, I began to research America’s Middle East policies. Being a follower of the nonviolent Jesus, I was led to join the Olive Trees Foundation for Peace, founded in Orlando by a 1948 Palestinian Muslim refugee from the Galilee who made his way to the USA and realized the American Dream. Dr. Diab inspired American Christians, Jews, Muslims and others to learn about the Israeli Palestinian conflict and we raised funds for over 40,000 fruit bearing trees that were rooted on both sides of The Wall before the non-profit disbanded. In 2005, Dr. Diab guided me on my first of 8 trips to both sides of The Wall in the Holy Land. But I knew nothing about the USS Liberty until 13 October 2007, when I heard Phil Tourney speak in California at “The No More Wars for Israel Conference,” which had been dedicated to Israel’s nuclear whistleblower, Mordechai Vanunu. I was asked to speak at the conference because I had been publishing interviews with Vanunu that freely streamed at YouTube and were enshrined in hundreds of articles and four of my so far eight books. I knew in a flash I would never give up telling the Vanunu saga until he is free to leave Israel simply because Vanunu told me: “In 1955, Perez and Guirion met with the French to agree they would get a nuclear reactor if they fought against Egypt to control the Sinai and Suez Canal. That was the war of 1956. Eisenhower demanded that Israel leave the Sinai, but the reactor plant deal continued on. “The Germans gave the money; they were feeling guilty for the Holocaust, and tried to pay their way out. Everything inside was written in French, when I was there, almost twenty years ago. Back then, the Dimona descended seven floors underground. “Kennedy demanded inspections. When Johnson became president, he made an agreement with Israel that two senators would come every year to inspect. Before the senators would visit, the Israelis would build a wall to block the underground elevators and stairways. From 1963 to ’69, the senators came, but they never knew about the wall that hid the rest of the Dimona from them. Before I made the trip to California, a few human rights activists warned me that I should not attend the “No More Wars for Israel Conference” because anti-Semites, neo-Nazis and white supremacists would be in attendance! I thanked them for their concern and imagined Jesus would welcome the opportunity to speak to anti-Semites, neo-Nazis and white supremacists and so I gleefully traveled from Florida and arrived in California to learn I did not even have a room at the inn where the conference was scheduled to take place. The hotel had cancelled the event due to complaints that there would be anti-Semites, neo-Nazis and white supremacists in attendance. The conference was rescheduled at a church nine hours later and indeed, I did not agree with many things some of the other speakers said, but I uphold that all people have the right to think their own thoughts and speak their own minds. However, when USS Liberty survivor and then current president of the USS Liberty Veterans Association, Phillip F. Tourney spoke about that day in infamy on 8 June 1967, I knew why I had made the trip! Tourney spoke in depth about the 34 Americans who were brutally slaughtered, 172 wounded (including himself) all because Israel attacked America’s virtually unarmed premier spy ship the USS Liberty while she navigated in international waters during the Six Day War. When Phil said “It was God that kept the Liberty afloat” I knew I would do more than just listen to him. I didn’t see Phil again until 11 September 2016. I flew from Florida to Colorado in support of what I had hoped would be a nationwide USS Liberty speaker’s tour but things worked out differently. Phil had just picked up the first press copies of his second book “Erasing the liberty” and launched them at the talk he gave to a Sabeel group. Reverend Naim Ateek, a 1948 Palestinian refugee who lost his home but remained in Jerusalem, founded Sabeel in Jerusalem. Sabeel today is a global ecumenical Christian organization dedicated to ending Israel’s occupation of Palestine in accordance with international law and universal human rights. On the flight home I read Phil’s second book. When I got to this next part, I knew I would do more than just read it. One of my duties was to check the CT spaces for any leaks or signs of future trouble. I would go down there alone . . .
Every time I descended into this silent grave-this killing field where so many of my shipmates had been murdered. I could feel the eyes of them upon me as I moved. I felt they could read my every thought and I could hear their voices crying: DO NOT let what happened to us be forgotten . . . Filming of “THIS AMERICAN and The USS LIBERTY: Documentary” begins at Arlington Cemetery’s graveside memorial service for the 34 USS Liberty servicemen killed on 8 June 1967. “THIS AMERICAN and The USS LIBERTY: Documentary” will feature interviews with USS Liberty Veterans. Our mission is to establish every June 8 to be known as USS Liberty Remembrance Day. Eileen Fleming, Author, Producer “30 Minutes with Vanunu” is the Senior Non-Arab Correspondent and Health Reporter for TADN, she ran for US HOUSE in 2012 on a Platform that included ending federal regulations on cannabis, to establish every June 8 to be known as USS Liberty Remembrance Day, and to end USA collusion in Israel’s nuclear deceptions and military occupation of Palestine. Eileen Fleming’s contact information is HERE. 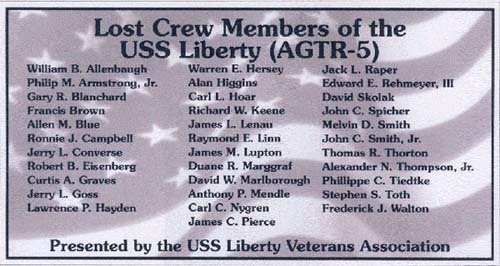 We will have a room set up to video tape every USS LIBERTY veteran at the Norfolk, VA. reunion [June 8 through 11] who wants to tell Americans what they need to know about LIBERTY! You go girl. I have seen you for years stand in the middle of hell on earth, and still you are staunch, and never waivering. I will be at Little Creed staying during the reunion with some of my family. They are wanting to see the exhibit at the Cold War Museum, or Nauticus. We will be given the tour by one of the curators that I have known for years. I just want to live long enough, to see this all happen.